You are here: Home » Tower Heist: A big disappointment! Tower Heist: A big disappointment! I must admit I was excited to see Tower Heist as there was so much hype about Eddie Murphy being brought back to his former glory in this film. Well, it did anything BUT that. 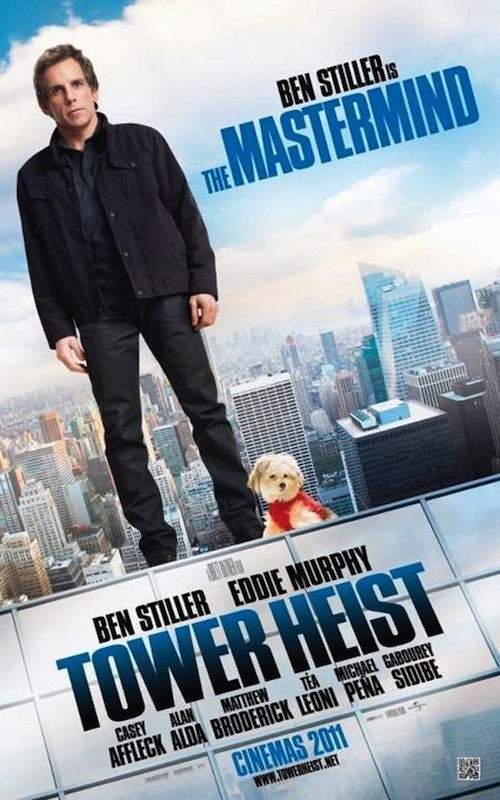 Tower Heist is a true Brett Ratner joint: little brains to this caper, but its fun fluff, exciting to watch, and showcases a welcome return to form for Eddie Murphy. True, that there are “little brains to this caper,” but I am sorry to say that the “welcome return” for Eddie Murphy is totally off the mark. Not once did he make me laugh at anything he said in this film. Also his co-starring role is minimal. You only see him briefly at the beginning of the film, as the small time criminal, Slide that is Josh Kovac’s (Ben Stiller) neighbour and then you don’t see him again until the heist is being derived, which is in the last part of the film. The story revolves around Josh Kovacs, who is the manager of one of New York’s most prestigious apartment buildings. When his favourite tenant, wealthy businessman Arthur Shaw (Alan Alda) is arrested for fraud, everything falls apart for Kovacs and his employees. This is because Kovacs took the liberty of entrusting his employee’s pensions to Shaw in hopes for a big return. However Shaw squandered the money in a Ponzi scheme, leaving the employees with nothing. In retaliation he, along with his petty crook neighbour, Slide (Murphy), a few of his employees, (Casey Affleck and Michael Pena) and a former wall street and now bankrupt tenant (Matthew Broderick), concoct a plan to steal $20 million back from his apartment. All in all, this movie is a big disappointment with unrealistic situations. It was slow to the punch and there were very few laughs to be had. So why are they calling this a comedy you ask, well maybe it is the one-liners offered up by Matthew Broderick’s character, which make you at best, crack a smile. Tower Heist is Worth Seeing on video. Made me laugh and held my interest more than it should have, given how sloppy it is. Call it an acceptable bit of B-minus work from a C student. Good review. Just watched the trailer. Is there something a bit racist about one black guy teaching four white guys how to steal? Yes, I believe that there is. I do not understand the reviews that are out there saying that this movie has brought Eddie Murphy back to his former glory. If this is it, then I he should hang up his hat!